A few weeks ago I had the opportunity to see composer and computer-music pioneer Jean-Claude Risset present a concert of his work at CCRMA at Stanford. Risset has made numerous contributions to sound analysis and synthesis, notably his extension of Shepard Tones to continuously shifting pitches. The sound of the “Shepard-Risset glissando” where pitches ascend or descend and are replaced to give the illusion of a sound that ascends or descends forever. You can hear an example here, or via the video below. Sadly, I arrived slightly late and missed much of the first piece Duo for one pianist (1989-1992), featuring Risset himself on a Yamaha Disklavier piano. The duo comes from the computer control of the piano simultaneous to the live human performer. It’s not a simple computer-based accompaniment part, but rather a duo in which the actions of the live performer are interpreted by a program (written in an early version of Max) and inform the computer response in real-time. The remainder of the concert features works for multichannel tape. The first of these pieces, Nuit (2010): from the tape of Otro (L’autre) featured eight channels with meticulous sound design and spatialization. The ethereal sounds at the start of the piece sounded like either frequency-modulation (FM) or very inharmonic additive synthesis (actually, FM can be represented as inharmonic partials in additive synthesis, so hearing both techniques makes sense). Amidst these sounds there emerged the deep voice of Nicholas Isherwood speaking in French, and then later in English as well – I specifically recalled the phrase “a shadow of magnitude.” Surrounding the vocal part was a diverse palette of sounds including low machine noise, hits of percussion and wind tones, a saxophone trill, tubular bells and piano glissandi. There were examples of Shepard-Risset glissandi towards the end of the piece. The next piece Kaleidophone (2010) for 16-channel tape begins with similar glissandi, providing an interesting sense of continuity. In this instance, they were ascending, disappearing at the top of the range and re-emerging as low tones. Above this pattern a series of high harmonics emerged, like wispy clouds. The glissandi eventually switched to both up and down motions, and subsequently followed by a series of more metallic tones. At one point, a loud swell emerged reminiscent of the distinctive THX announcement at the start of most movies; and a series of percussive tones with discrete hits but continuous pitch changes, getting slower and slower. There was a series of piano-like sounds with odd intonations played more like a harp, followed by gong-like sounds reminiscent of gamelan music but with very artificial pitches and speeds. Industrial metallic sounds gave way to a section of tense orchestral music, and the long tones that subtly and gradually became more noisy and inharmonic. A sound like crackling fire seemed to channel the early electronic pieces by Iannis Xenakis. Highly-comb filtered environmental sounds gave way to eerie harmonies. They constantly changing sounds lull the listener in a calm state before starting him or her with a burst of loud noise (perhaps the most intense moment in the entire concert). This was followed by machine noises set against a sparse pattern of wind pipes, and a large cloud of inharmonic partials concluded the piece. I had actually not looked in advance at the subtitle in the program of “Up, Keyboards, Percussion I, Percussion II, Winds, Water, Fire, Chorus, Eole” – but my experience of the piece clearly reflected the section titles from perception alone. The final piece Five Resonant Sound Spaces for 8-channel tape began with orchestral sounds, bells and low brass, gongs (or tam tam), timpani. The sounds seemed acoustic at first, but gradually more hints of electronics emerged: filtering, stretching and timbral decomposition. A low drone overlaid with shakers and tone swells actually reminded me eerily of one of my own pieces Edge 0316 which was based on manipulations of ocean-wave recordings and a rainstick. This image was broken by a trombone swell and the emergency of higher-pitched instruments. The overall texture moved between more orchestral music and dream-like water electronics. A series of fast flute runs narrowed to a single pure-tone whistle, which then turned into something metallic and faded to silence. All at once, loud shakers emerged and granular manipulations of piano sounds – more specifically, prepared piano with manual plucking of strings inside the body and objects used to modify the sound. The sound of a large hall, perhaps a train station, with its long echoes of footsteps and bits of conversation was “swept away” by complex electronic sounds and then melded together. A series of high ethereal sounds seemed to almost but not quite be ghostly voices, but eventually resolved the clear singing voices, both male and female. The voices gave way to dark sounds like gunfire, trains and a cacophony of bells – once again, channeling the early electronic work of Xenakis. A breath sound from a flute was set against a diversity of synthesized sounds that covered a wide ground, before finally resolving to a guitar-like tone. The concert was immediately followed by a presentation and discussion by Risset about his music. His presentation, which included material from a documentary film as well as live discussion covered a range of topics, including using Max and the Disklavier to perform humanly impossible music with multiple tempi; and marrying pure sound synthesis with the tradition of musique concrete, with nods to pioneers in electronic music including Thaddeus Cahill, Leon Theremin, Edgard Varese, and Max Matthews (who was present at the concert and talk). He also talked about the inspiration he draws from the sea and landscape near his home in Marseilles. The rocky shoreline and sounds from the water in the video did remind me a lot of coastal California and made it even less surprising that we could come up with pieces with very similar sounds. He went on to describe his 1985 piece SUD in more detail, which used recordings of the sea as a germinal motive that was copied and shifted in various ways. Percussion lines were drawn from the contours, he also made use of sounds of birds and insects, including the observation that crickets in Marseilles seem to sing on F sharp. I did have a chance to talk briefly with Risset after the reception about our common experience of composing music inspired by coastal landscapes. Overall, this was an event I am glad I did not miss. On Sunday night I attended the final performance of the San Francisco Tape Music Festival. This performance featured a retrospective of works by composer and “sound diffusion guru” Jonty Harrison. He was visting from Birmingham, England, and on site to present his pieces and personally mix and diffuse the sound in the hall. “Tape music” of course need not be on audio tape – indeed, all the pieces in the performance were rendered from digital media on a laptop. Indeed, it would better be described as “sound diffusion performance”, in which pre-recorded media is mixed and rendered via a large speaker system into a concert hall. The immersion in the sound coming from the speakers and the fact that this experience is shared with other audience members, makes this a true performance rather than simply listening to a CD on a home stereo system. Additionally, the active shaping of the sound via live mixing and diffusion makes each performance unique – the speakers are the instrument. The environment at the theater at Fort Mason was relatively comfortable for listening, and the concert featured a state-of-the-art 18+ speaker sound system. I was fortunately able to get a seat towards the center of the hall in order to get the full experience. One of the other motivations for performances with pre-recorded media was that many electronic sounds could not be rendered in real time on available technology, although that limitation has diminished. It was probably the only way for Harrison to realize his 1982 piece Klang, but my sense is that portions of his 2004 piece Rock’n’Roll could have potentially been done in real time, albeit without the precision of pre-recorded media. Klang opened the concert. It began with a sound that suggested a metal or ceramic kitchen dish – the program notes say that it was in fact a casserole. At first, the connection to the recordings was quite transparent, as if listening to an ensemble of invisible casserole performers. But over time it diverged from the original, with more time stretching, harmonization and other effects and layering into larger structures. This builds up to a climax of pitch-shifting sounds that seem more water-like than casserole-like before returning to the original sound alone for the conclusion of the piece, I liked the way Harrison built up the piece from a single simple sonic idea – a compositional technique that he employed for all the pieces presented this evening. ..et ainsi de suite… was described as a “French Suite rather in the manner of the musique concrete tradition.” It is based on a series of acoustic recordings of rough wine glasses that were transformed through a variety of signal processing techniques to form a series of movements. Like Klang, it featured an exposition and recapitulation of the original sounds, but I did not get an overall narrative of the other movements, which featured more signal processing. Instead, I found myself getting lost in the sounds, which is not necessarily a bad thing. The next piece, Rock’n’Roll, was the most recent of the pieces in the concert, composed in 2004. It is based on the sounds of a “garden roller with a concrete wheel” and the ensuing sonic mischief when trying to roll it around the composer’s garden pathways. I had to do a Google image search after the performance to find concrete garden roller. It seems that these are more commonly found in the UK. Nonetheless, the sound of rolling concrete against stone does provide for a rich source of material as does the sound of falling and breaking rock. This piece kept close to original timbres, though Harrison did explore time and especially space with advanced mixing and diffusion into the 8-channel array. By mixing the sounds spatially, sublet timbral effects can be achieved, and the listener is not watching a garden roller but instead listening from within a pile of falling rocks. It seemed that each of the pieces followed the pattern of exploring a particular physical material: ceramic, glass, concrete/stone. The next piece Stream was all about water. However, while it was initially quite recognizable as water, the sound quickly took an otherworldly quality – the listener was immersed in an environment that was unmistakably liquid, with bubbles and burgled and undulating waves, but unlike any natural aquatic environment on Earth. Once again, I got lost within the sonic environment and lost track of the details and progression of the piece – although it did quite loud at times. The final piece Hot Air was a bit of a departure, and felt like it had a more dynamic sound pallets and musical structure. It was nominally based on another element, air, but the sonic source material seemed more varied than inth previous pieces. There were direct references to air, such as stretching balloons, whistling sounds, and things being hurled through the air. But the timbres also had a very machine-like and industrial quality at times, and these were things that I visualized while listening to the piece. Large industrial machinery, neon electrical signs, etc. But every so often a clear reference to air came through, and some of the moments with balloons or other objects were quite comical. I even heard some of my neighbors in the audience laugh. During the intermission, I viewed several works of visual art by Aaron Finnis based the concept of tape. 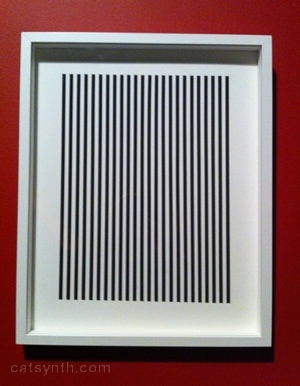 Basically, he used magnetic tape on paper to create minimalist textures of vertical stripes. The simple texture and geometry and connection to the festival theme was itself interesting, but there was an added dimension when one matched the titles to the works. The titles, included information about the tape used, such as capacity in megabytes for data tapes, or duration in minutes and seconds for audio tapes. For example, FIELD 9000 (9MB, ASCII Colors) described the data size and content of the media, although the media was now a visual art material and perceiving the content was not a possibility. Additionally, three of the cassette audio tapes seemed to be drawn from recordings of pure tones, with labels such as SPACE 440 (4.00 mins, A400). As promised, here is my post on the San Francisco Tape Music Festival. I had an opportunity to attend last Saturday’s program. First, a word about “tape music.” Of course, it does not actually have to be on tape. Indeed it is now most often rendered as digital media: DVD or audio files. The San Francisco Tape Music Collective (which runs the festival) defines it as “audioArt diffused through a surround-sound speaker environment.” Essentially the “audio art” is music or other sound rendered onto media, and the performance is the live performance of that media in a hall through a speaker system. The way the media is mixed into the speakers and the live space creates a unique performance. And the fact that the material is recorded on media allows composers to create sounds that could never be performed live, even with modern computers – although the gap between what can be done live and what can only be rendered is narrowing over time. In the early days of electronic music, tape was in fact the only way to realize sounds, and thus the only way to perform the music. Modern tape music carries on that tradition. The idea of going to concert hall and listening to a recording may seem odd, but like any other performance, it is about matching the content and presentation. There are really good tape-music performances, and really bad ones, and I have been to both. The Saturday performance at the festival was definitely a good one. It included classics of electronic music, such as John R Pierce’s Stochatta, one of early experiments in computer music at Bell Laboratories; and Lubiano Berio’s Thema (Ommagio a Joyce). Both pieces were premiered over 50 years ago. John R Pierce may be familiar to longtime readers of CatSynth as one of the co-discovers of the Bohlen Pierce scale. Most of the other pieces on the program were far more recent, with the most recent being the premier of Cupido’s Suitcase by Cliff Caruthers. A series of three pieces in the first half, Winter Light (for Ingmar Bergman) by George Cremaschi, Pre-fader: Highly reverberant states by Goran Vejvoda and Chart Tempo & World Retrograde by Jon Liedecker/Wobbly explore three different aesthetics within recorded sound art: simple (but very powerful) sound synthesis with two oscillators, complex collages of sounds, and remixing of popular-music elements, respectively. One piece that also got attention when the program was first announced was a piece by The Fireman, which is actually a due of Paul McCartney and Martin Glover aka Youth. As a piece on the program, I don’t know that is as memorable as the others I have discribed. The program closed with a rather “hard” piece buzzz by Geraud Bec, which I leave to the reader’s imagination. Works by Maggi Payne, Zhiye Li and Kent Jolly rounded out the program. Overall, a very even performance, there was no point at which I didn’t want to be there listening. I also think that this series is fairly accessible for those who are not familiar with contemporary or experimental music, nothing is too harsh or too provocative – then again, I don’t know if I am the best judge of that.